I shared a house with my mother-in-law for 22 years. In that amount of time a person can become accustomed to the habits and routines of everyone in the home. But while I knew and understood those things about Jan Lillywhite, I’ve concluded that I only knew a little about her mind. She missed her Mom > One mother’s day about 20 years ago, Jan, the stunning Mrs. Clark and I were out for breakfast at a greasy spoon on Aurora. When Sherry asked Jan a question about her own mother, Jan broke down and covered her face. Her sentimentality was something she kept very close, so this was unexpected – but very welcome. It was the only time that I saw her cry in public. And while she rarely spoke of Margaret Swart, it was clear when she did that her own mother was held in very high regard. She loved her children and grandchildren > As I compiled photos for today’s slideshow, I noticed something important. In each picture that had a child of any generation, she had a certain look on her face. For Jan that was neither a smile nor a frown. It isn’t described in words, other than to say it was possibly the most contented expression I had ever seen on her face. Her love for Sherry, Eric, and the grandchildren could be seen there – in the relaxed eyes and slight upward turn of the lips, and more implied than demonstrative. Her life was an intricate web of detail > Every corner of Jan’s life touched another corner. And there were 8500 corners. In her world, every move, every item, and every word had a connection to each other. At the doctor, she was “Four Foot Eleven and A Half” and not just “Five Feet.” Coffee took Six Creamers – no more, no less. A trip from one end of the house to the other included plans to do at least five different things along the way – instead of just walking. It saved energy. Her dishwasher load jobs were NOT just a bunch of dirty stuff piled on the pullout shelves; they were magnificent puzzles of efficiency that used every potential centimeter of space inside. I was never able to match this skill or satisfy the need to have it “done right.” Living this way was complicated; to this day I have NEVER figured out how she managed to organize books or load the dishwasher; those things will live with her in legend, as I stack my books wantonly and clank bowls and plates in my pursuit of keeping a clean kitchen. She was the Master of Remote Controls > Jan had two cable lines to her room, feeding two TVs, a DVD, and a DVR. Through some marvel of planning, Jan was able to watch, record, and plan like she was the director of a Media Command Center. I was the one who set up the equipment so many years ago, but I have no clue now how it works. That, like the dishwasher, has become family legend. She loved her plants > Books, TV, and crafts brought Jan much joy. But more than these she loved gardening. When she was physically able, Jan kept nice annuals, perennials, and other greenery which now dots our yard. This will never be the same, due to my acute ability to kill anything green. But for those plants which survive my ten brown thumbs, they will remain at our home as part of Jan’s gardening legacy. The relationship I had with my mother-in-law is probably what you would expect: Not Easy. But it was the right thing to do, having her close and making sure she had a comfortable retirement. During my care for her in the final days I can safely say – as the rest of her body grew weaker – that her hugs grew stronger. Her thankfulness in those days, like the warm smile she had around children, was implied. It was just something we knew, even if we didn’t see it all that much. This came from connecting with her on a level which took 22 years to cultivate. While I only knew her a little, what I knew meant a lot. My house is filled with reminders of a heart which beats no more. As we careen through a week – and counting – after my Mother-in-law Janice passed away, Sherry and I have seen our lives get mostly back to normal. Yes, we still have moments of emotion. We have both been going into work, taking The Clark Boys on outings, and going to the things we attended prior to Jan’s illness. Hospice care is done. The machines of life have been picked up, and the remaining medicine has been dispatched for safe disposal. The Death Certificate arrived today on a big brown truck. No longer do we hear the sounds of Care. In a sense we have regained much of our lives and increasing amounts of composure. Until I look down and I see a pair of shoes. 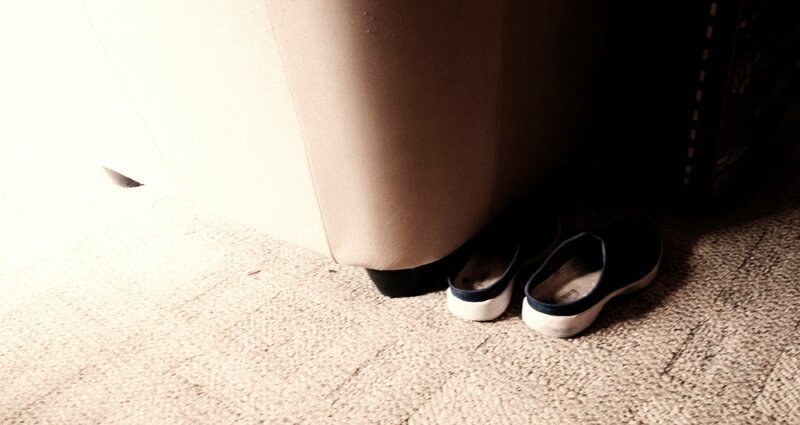 Jan’s blue slip-on shoes sit behind her favorite chair, put there during her last visit to the living room over two weeks ago. I noticed them a few days back. I don’t want to move them, even though I know I should. In a way, those shoes say she is still here, reading her mystery novels and checking her blood sugar. They point to a time when she could walk. They would have been on her feet while ordering fish & chips at Red Robin (with cocktail sauce instead of tartar). Those shoes would have seen Jan water a thousand plants in the yard – ones that I have managed to kill through an acute inability to care for anything green. Those shoes are her now. One of the last things she asked me to do for her was to put shoes on her feet. They aren’t the only reminders we have. In the kitchen sits the small hand-sized cutting board she used for onions. Her crafting supplies take up every spare nook in the laundry room. Upstairs the mundane things of life – an overworked DVR, more shoes, 1980s business suits, toothpaste, a special mouthwash, and towels in a design only Jan would buy – keep her memory alive in the house. We can’t keep it all; looking around our cluttered house we get that point clearly. Sherry and her Mom lived here from 1970 on, which means there is plenty of stuff that can move on (ours and hers). It will be a chore figuring out what items should be kept to remember Jan, what items will be shared with family, and what can be donated to help someone else live better. 43 years of reminders – tucked, here, there and everywhere. 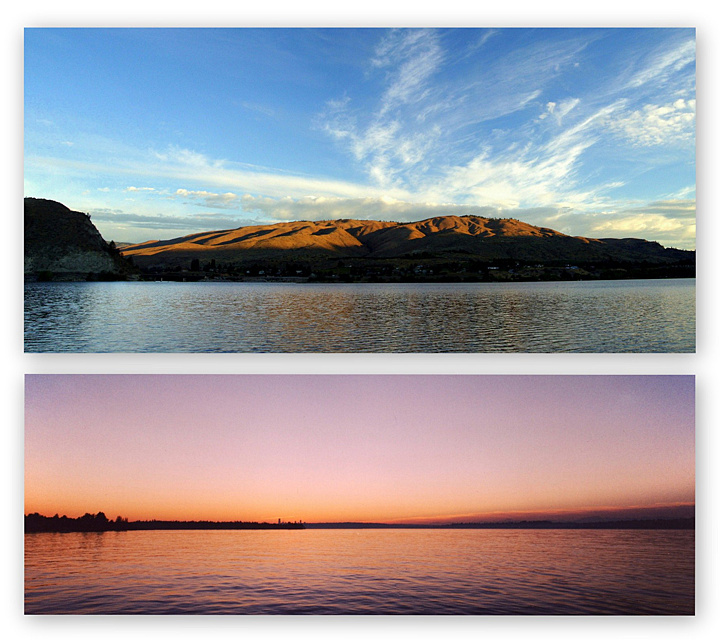 One of the hardest things I did this week was to compile photos of Jan for her memorial service slideshow. More reminders of her life, in full view, and marking the years of good and bad. I didn’t use all the ones I found. Some carried the kinds of sad memories that simply need to go on a back shelf, like the last picture I took three hours before she passed. The rest make me cry, and I have done so each time I have viewed the file in preparation for the service; even today, watching it large on the sanctuary wall, brought the tears. Sometimes it’s hard being a visual learner. Reminders aren’t a bad thing. Being sentimental is tough, but worth it. If looking at shoes makes me sad, I’m pretty sure this indicates I have a soul. It’s safe to say, even though Jan and I had a difficult relationship, that I have some good reminders mixed in with the not so good. In a way those shoes in the living room are the kinds of things that will help me remember the good times, instead of her gruff commentary or constant cough. I need more of that. Twenty-two years in the same house with a mother-in-law was not easy, but the right thing to do. I need every positive bit I can find. Eventually those slip-on shoes will go to Goodwill. And I will become the guardian of the spirit they represented. 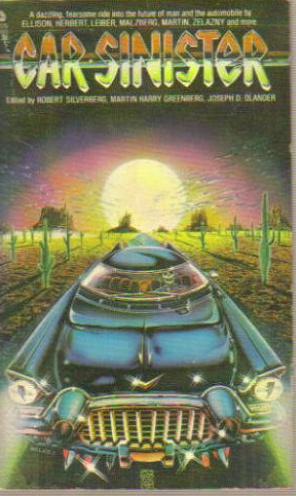 In the late 1970s I had a paperback book named Car Sinister, which was a collection of short sci-fi stories that were focused on cars. In one of the stories a car got pregnant, and the offspring looked like two different ones. 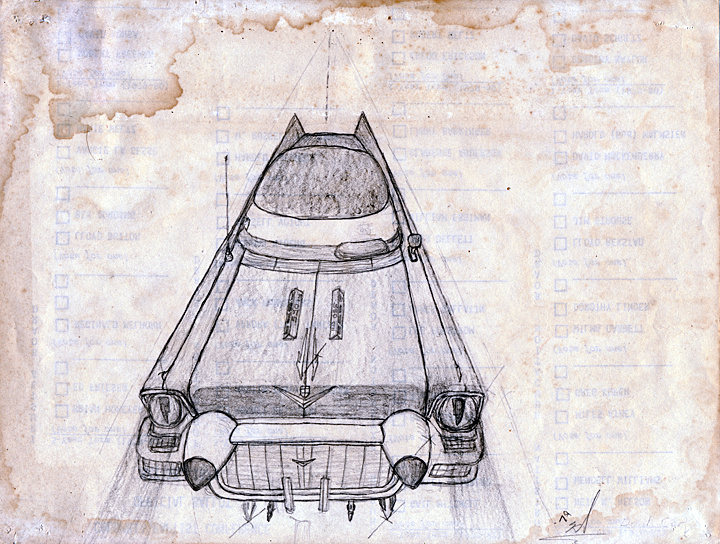 Another story – which gave the book its title – was about a car that ruled the desert and attacked all who came within driving distance. I don’t remember much else about the book. But I remember the cover. It looked like my drawing above from 1979. The cover was of course better than my rendition, but in any case I wanted to draw it for myself. My version was done in pencil on the back of recycled paper from my Mom’s office – presumably some kind of ballot for a committee meeting. I made the headlights into eyes. The hood louvers were based on the design from a 1966 Chevy Malibu SS. In art class at the time, we had been working on perspective; this was perfect subject matter for practice. The mid-50s Cadillac remains one of my all-time favorite cars. I would own one today; two-door, four-door, hearse, airport taxi – doesn’t matter. That front end design with its huge bulby bumpers and egg-crate grill are part of classic American design. Yes, they were heavy. Yes, they were somewhat underpowered. But drive up to an event in one even today and you will get a response. Usually favorable. Maybe not so much, if it’s packing heat like Car Sinister though! And the two work, as single/simple entities, to make a situation appear. Both losing the battle every time, as the other takes over at the end of a given stay. But are forever parted by their differences. A couple years ago a batch of personal journals was unearthed from a box in my parents’ attic, and memories of that time came rushing back. The work above was transcribed from an 87-cent K-Mart ruled binder within the collection. 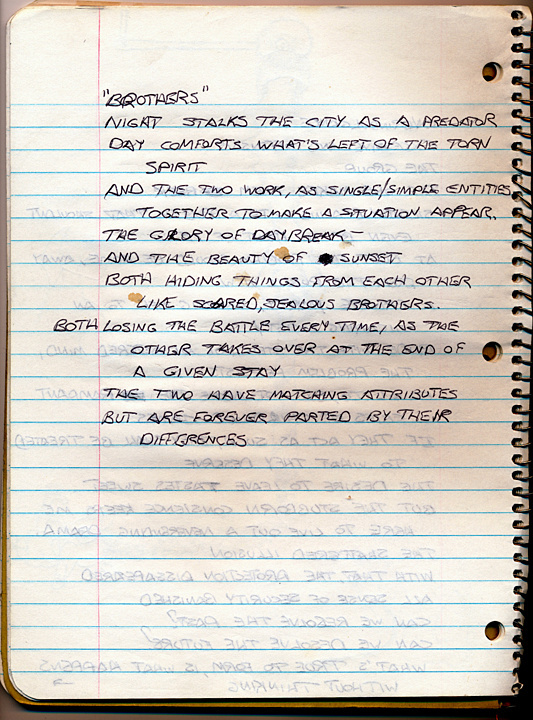 In the mid 1980s I did a lot of free-form writing; not sure if it could be called poetry or even story, but I always had a binder with me. Thoughts were written down quickly with little regard for spelling or punctuation, basically nouns strung together with a few verbs. 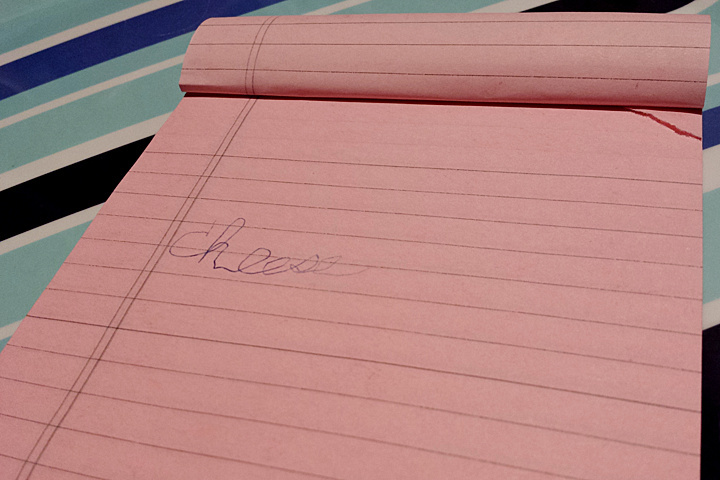 Because I think faster than I write, my goal was to pen it in before I could forget the thought. The resulting style was reminiscent of singer/poet Jim Morrison, which makes sense since I listened to a lot of music from The Doors. As I read the journals now, it seems I often used one word to express multiple feelings or experiences. The subject matter was often about emotional pain, and the word choices – sometimes unusual and on-the-fly – truly reflect what I felt at the time. I was hurting inside; in 1984-85 I lost several mostly-menial jobs in a row. A roller-coaster relationship had taken its toll for a few years. I was questioning my ability to fit into society at all. The mid-1980s was a very low time for me, and I hold onto the good memories tightly…because there weren’t many. My life stabilized in early 1986, and the confidence of my earlier days was finally restored. Reading those pages is like experiencing time travel. “Brothers” was probably written at night, over coffee, and as I looked out the window at a Seattle Dennys on Aurora Avenue and N 155th Street. The house is oddly silent. For a last couple months our noisy friend in the living room has pumped oxygen through a tube, up the stairs, and through a cannula to help my mother-in-law breath. After she died our noisy friend was given a vacation. He had worked well – tirelessly, without complaint – and provided the most basic requirement for a women who needed comfort in her final days. A quiet now hangs in the air with our noisy friend shut down; his hum/hiss no longer fills every corner of the home. It’s symbolic of Jan’s passing – plain and simple. His departure is not the only reason our house is quiet this morning. Jan had a constant cough the entire time I knew her. We lived in the same house for 22 years, and her rattle had become a part of the ambiance in every way our noisy friend in the living room had in the last two months. A person would walk in the door and expect to hear the cough. However unpleasant to the ear, it meant she was there. But this means she is now comfortable, never needing to clear her throat or struggle to say anything. Ever. No longer will she be frightened. or frustrated by a body which doesn’t doe what she wants it to do. She is at peace, and the memories of her life – like her cough – have now transitioned to part of family lore. The cough went l silent, but not her legend. Sherry and I have been inspired, comforted, and literally bowled over by the outpouring of emotion, love and kindness from our friends and family during Jan’s last days. Words do help in circumstances like these. It was an sad and amazing journey – one I tried to share with you in my own way. Nobody would choose to repeat it. Nevertheless I am now prepared to take it on again. Of course, NOTHING prepares a person for the emotion of losing a loved one. All you can do is hang on and let the tears roll. Even now as I sit in the quiet of the downstairs, the GOOD parts of my relationship with Jan run through my head. I want to keep those alive, and tuck away the difficult encounters we had over the years. She wasn’t easy. Her head was complicated. She had a sharp tongue. I pushed all of this aside in the final weeks because there was no reason to let it interfere with giving her what she needed. Her comfort in the end was worth enduring every hard word, every passive comment, and the years of rattling coughs. The silence of our house is now filled with her soul. It had been a difficult night. After contacting the on-call nurse overnight I was able to help Jan get to sleep through a combination of medicine and companionship – meaning I slept in the lounge chair next to her bed from 2:00am on. She had no strength. I was unable to get her situated with her back upright in the adjustable bed because she was like a 150-pound sack of flour. But I was able to get her lying flat and – apparently – in some comfort because she rested without any movement. Until I got up from the lounge chair at 6:00am and the caregiver bell rang. “Bathroom,” she said. By now her sentences were often trimmed down to one or two words. I started leading her to towards the bedroom door by holding both of her hands and walking with her. She got about three feet and began to collapse. No strength at all. I quickly set her into the lounge chair and ran downstairs to grab the rolling chair we had bought for son Jack. Thankfully I was able to roll her from the bedroom to the bathroom, help her with her needs, and roll her back. I offered to get her cough medicine and nebulizer, which both help her breathe. So I made her a glass of ice water downstairs and called the Hospice line to report that she refused to take medicine. A nurse called back and eventually visited mid-morning. Checking her vitals found nothing out of the ordinary, only a woman in slow health decline. The nurse was able to give Jan the medicine I tried giving her earlier. While the nurse also talked with Sherry and me, Jan fell asleep in her chair. We talked about how she hadn’t been eating at all, and how difficult it was helping her in the way the room was set up. The nurse ordered more medicine and a hospital bed, because it was clear that the bed she had would be more of a deficit going forward; home health care was to start the next day, and we needed to make it easy for someone to help her. The nurse said she would check in later in the day. I checked on Jan several times, and found her asleep during easy stop down the hall. Sherry went to buy some incontinence supplies and a baby monitor because, by this time, the caregiver bell was beginning to stress us out. Then the caregiver bell rang at about 2:00pm. “Where’s my brown bag?” she asked when I went in the bedroom. She was fidgeting in the chair, checking for something around her hips. I paused for a second, not sure how to respond. “Why do you need to leave?” I asked. “Because I need to pay,” she said while fidgeting some more while looking for a wallet around her hips. I took her down the hall and helped her out a second time within an hour. Again, the roller chair was necessary because she had zero strength. My process to get her to and from the chair (or bed for that matter) was to say, “Grab my neck with every bit of strength you have Jan!” She would, and it was not only a way to get her shuffled around but also an excuse to hug her hard. It also allowed me to “be the might” and to transfer her with my own power. This act – out of any I did for her – gave me more sense that I was helping than any other thing I did. This was pure power transfer – using my muscles where hers no longer functioned. I pulled mine several times over the final week. It was symbolic, hard, and rewarding. At 2:30pm she asked that I help her to the bed. I did so, and got her all laid out, but she kept putting her legs over the side and trying to sit up. She kept fidgeting, moving her hands around her hips. She kept looking for her wallet but stopped abrupty. ‘“Guess not,” she commented after realizing that her jammies didn’t have any pockets. So I helped her back to the chair. As she requested these movements from one spot to another, I suspected that she was trying to get comfortable. Once she was in the chair she asked for medicine. About that time, Sherry’s father Jack arrived. Divorced from Jan since 1975, he was in town and came by to help me assemble the hospital bed that had been ordered. “Hello Jan,” he said to her after entering the bedroom. “It’s Jack.” They had been married for 12 years before splitting up. I sent a text message to Sherry to say that he had arrived. We talked about assembling the bed and what it would take to make it happen. After Jack left the room, Jan looked at me. At that point everything changed. All along our goal was to help her live out her final days at home, but this meant she was considering a move to somewhere else. I didn’t take her statement as a complaint that I wasn’t doing enough; rather, what I heard was that she finally understood she needed specialized care. Getting her in and out of bed was almost impossible with her lack of strength. At about 4:00pm I made the call to Hospice, stating that Jan had asked for advanced help. The nurse called me back, stating that it might be too late in the day to get her into overnight care – but that she would try. Sherry came home and I filled her in on what her Mom said. She and Jack headed upstairs to talk with Jan.
After Jack talked with her, she completely surrendered to the idea of having home car and said okay to being placed in a facility that could help her better. The bell rang again while Sherry and Jack worked out some details and made phone calls. “I don’t want to be alone,” she said. I sat on the bed while she was sitting in the chair, and sent a text message to Sherry saying that her Mom didn’t want to be alone. “Bed,” she said. So I moved her once again to the bed, but since I was unable to get her comfortable I instead sat next to her – hugging her and rocking her lightly back and forth. By then she had developed a gurgle in her throat – different from what she had earlier – and clearly something she couldn’t get out. At about 4:45 her breathing became more shallow. As she tried to speak, she couldn’t because the gurgle made them impossible to understand. Jack and Sherry came into the room not long after, and said that an ambulance would be coming to pick her up within the hour. Jan pointed to something along the wall, but at nothing in particular. She tried to speak the word but it didn’t come out. We would pick up items from the shelf, and she would shake her head. At one point – after picking up a box – she was able to say “put that back.” So Jack did. I grabbed a pencil and tablet from another room and brought it in. “Can you write what you want us to get?” She nodded. At about 4;55pm little Jack came into the room to see Grandma. I let him hang out for a bit and then took him downstairs when Jan started to struggle even just sitting up. I called my parents to say that Jan would be going somewhere to get more advanced care. At 5:00pm I heard an unusual noise from upstairs and Sherry came down quickly. Sherry was crying, which in turn made me cry. We held each other close as she described what happened. Her Dad sat in the chair next to Jan and held her hand – while also holding her up and steady. Sherry stroked her hair softly. Jack calmly talked about their time together in marriage, and about all the good times they had. Both he and Sherry told her it was okay to let go of life. Jan relaxed, pulled the oxygen line away from her face, and went comatose. Her eyes stared at nothing. For two minutes her breathing became shallower and shallower. Then the breathing stopped. We had given Jan all the care we possibly could, and ultimately helped her pass comfortably into the next life. It’s still hard to think about, even two days later. Sherry said the hardest part was literally watching the color run out of her Mom’s face in the end; that night she did not sleep well due to bursts of adrenaline that would pop out of nowhere. Of course, grieving includes “shoulda coulda” statements about things we could have done to make things better for Jan. 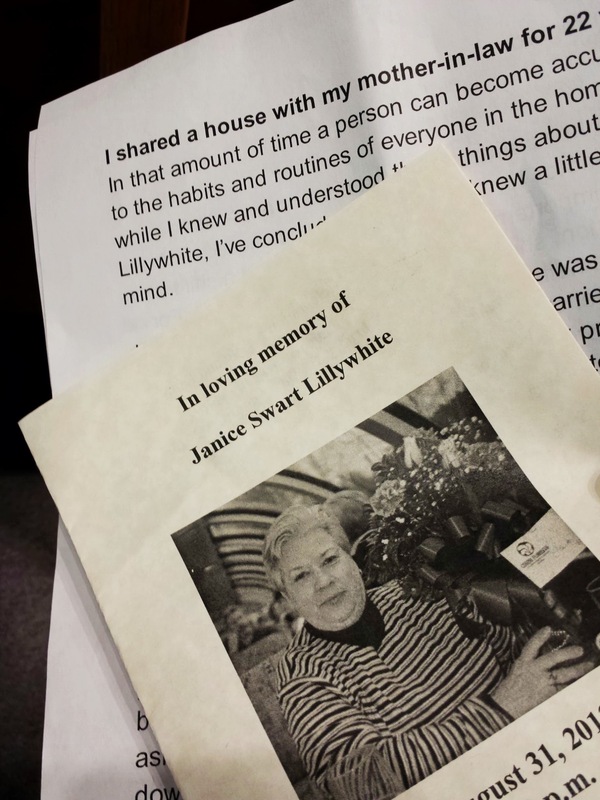 But in the end she was able to pass on in a home where she had lived for 43 years, and was surrounded by loved ones. Both boys were upset when we told them their Grandma had passed away. Their friends Mandy and Brandy in the neighborhood lost their Mom to cancer in early 2012, and their Dad said the boys should hang out with them and have dinner. I went back to the house and helped Sherry with arrangements and phone calls. Sherry’s brother and family arrived later to say goodbye. Eventually the boys came back over to the house. David went upstairs with Sherry and said goodbye to his grandmother. Later on – at his own request – I took Jack upstairs to do the same thing. “That’s a sign of respect,” David said behind him. Jack looked quietly at his grandmother lying on the bed, looked at me, and then launched into a prayer asking for God to care for her. I was so proud of him and his desire to make sure that Grandma was taken care of. While she wasn’t very demonstrative, I know Jan loved her grandchildren deeply. Sherry went upstairs to sit and talk with her for about an hour after that. The funeral home came to care for Jan at 9:00pm, which gave family plenty of time to pay respects. They were so graceful and kind in making sure everything was in place to get her out of the most difficult room in the house. Once she was gone, silence settled on the house – one without the oxygen machine and the constant cough we had become accustomed to over the last two decades. It was uneasy at first, and only made me think of her more. Sherry and I tried to figure out her final written word. In a literal aspect it made no sense. There was no cheese where she was pointing. It could only have been a reference to something else or someone who had a relation to cheese. She knew that David loves cheese and crackers at bedtime, so through a confusion which didn’t always give her the right word to use it could be she was asking to see him. But now we will never know the answer. And the mysterious word “cheese” will become part of our family lore.